Veno is a shadow beast that never shows off its face. They are very quiet but occasionally make small talk, however, they don't usually start a conversation. They can be curious and despite being a Shadow Beast, enjoy sitting in the light. Veno is cover in short black fur, and their tail is very soft like a pillow, which Veno uses to nap on and will let trusted people sleep on their tail as well. Veno only gets aggressive when someone tries to take off their little cloak. 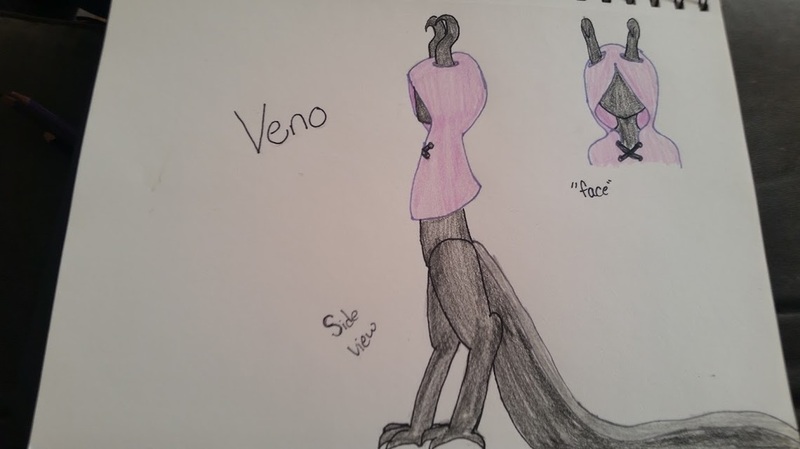 Veno can vanish into any nearby shadows and reappear out of a different one, Veno can also use shadows to make a person uneasy and anxious, as they can feed off of fear, though human foods also work to keep Veno full, they enjoy eating strawberries and pancakes the most. Veno becomes very fluffy after they get wet and shake off, so they try to avoid water when they can.